Surprise!!! Shirov is not paired in Round 5. ChessHive I’m guessing some personal circumstances made Shirov miss the 5th and possibly the tournament as a whole. In my opinion, he is actually not ‘bye’ — a bye will be given points normally. 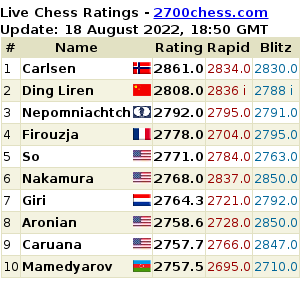 Based on his personal card in chess-results.com, he will get 0 points in round 5. Let’s just hope Shirov is cleared to play soon! Update: indeed he is not bye. He’s official status is “not paired”.